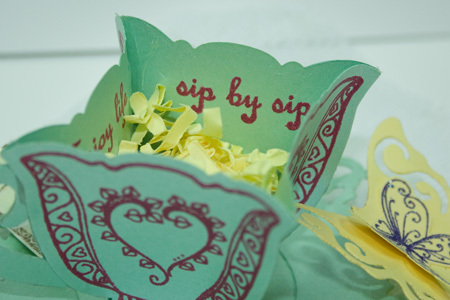 Shared Inspiration by Jill Jacobsen: Zendoodle Tea Sneak Peek! Here is the sneak peek that I promised! 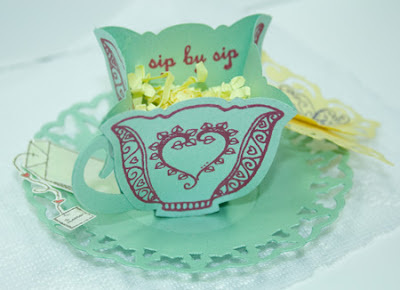 I have been enjoying my Zendoodles stamps and this Tea Cup one coordinates with the new Spellbinders Nested Tea Cups. As I was designing this stamp set I cam across this idea and couldn't wait to play with it. 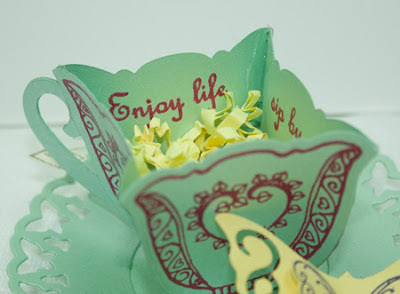 I have seen tea cups with designs on the inside so went and stamped one of the sentiments on the inside of the cup....it says "Enjoy life sip by sip". I simply embossed the tea cup 4 times and used the die to cut it out and the hand. Then cut a square bottom to place in the bottom of the cup. The saucer is the Spellbinders Butterfly Circle Die with a smaller circle cut out of the center, then just cut the butterfly doughnut and glue it back together to create the cupping, then glue it to the circle you that was cut out. 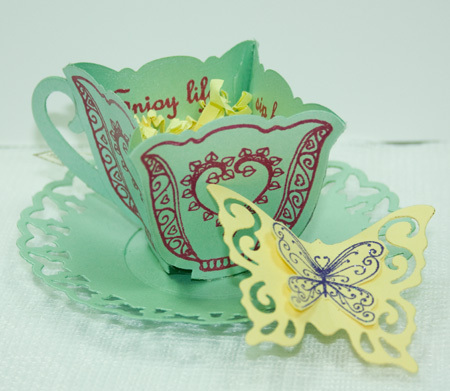 And of course the butterfly is from my Fancy Butterflies stamp set that coordinates with the Nested Butterflies Dies. It's a darling tea cup! 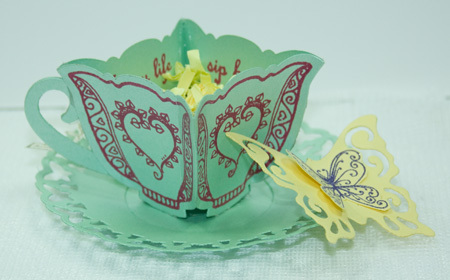 Nice idea to pair it with the butterfly circles for the saucer. What a cute tea cup! I absolutely LOVE this! Very clever Jill. Love how you "cupped" the saucer! So cute and creative!! Love how you combined this with the Fancy Butterflies and used the die for a saucer!! Love your idea! This is a wonderful project. Great job!